From basic rules to setting up a solid strategy, by the end of this guide you will be ready to conquer the roulette tables at your local or online casino! Roulette is a relatively simple game that involves betting on the number that a ball lands on when spun around a Roulette wheel. Each number also has a correlating color, red or black, that can be bet on as well. On top of straight numbers and colors, players can also choose to bet on combinations of several numbers or whether the number on any given spin is even or odd. Despite its simplicity, because you can bet on several different factors it is crucial that you learn the rules and form your own strategy before playing. If you are already familiar with the basics of roulette, then you can skip ahead and read out in-depth roulette strategy guide here. A Roulette wheel contains the numbers 1-36 as well as a spot for 0 and sometimes an additional spot for 00 and we will get into that later. Each spot on the wheel has a matching spot on the board, where bets can be placed. Keep in mind that the inside area includes bets with higher payouts, but lower chances of winning. The opposite can be said about outside bets, where odds are higher but payouts are significantly lower. In each box of the grid of betting areas on the board is a unique number as well as spaces where you can place chips on labeled Odds, Evens, and groups of numbers including 1-18, 19-36, different sets of a dozen numbers depending on their placement on the board, colors, and even columns of numbers. 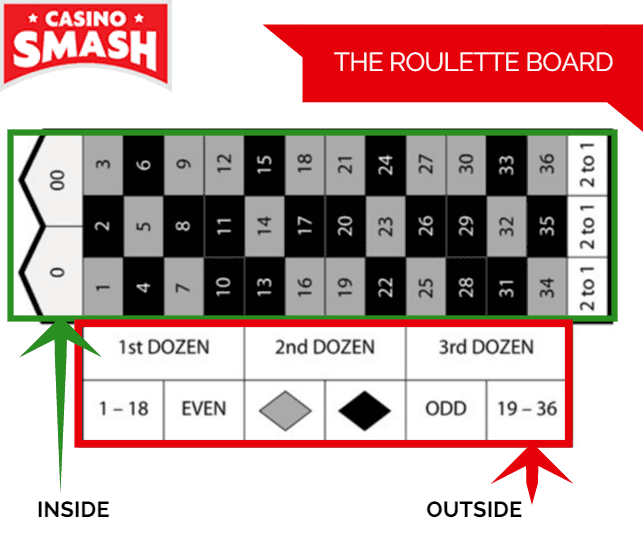 Before reading about the types of bets and odds, it is important that you are familiar with the board as well as the basic roulette terms used throughout the game. Bets can be placed in any one of the areas mentioned above. On top of that, bets can also be placed on lines within the number area to bet on two numbers at a time. Another option is to place your bets on the corner of four numbers to bet on four at once. As you can see, there are dozens of betting combinations that can occur. Let’s explore these options further by taking look at the basics of the types of bets and how they pay out. As mentioned earlier, inside bets are made by placing chips on the inside section of the roulette board. This can be done within number boxes or on various vertical or horizontal lines to place bets on multiple numbers. The most basic roulette bet is the straight bet, which is a bet that is placed on a single number and pays at a whopping 35 to 1. This is simply because the odds of choosing the right number is incredible low. A split bet is a bet placed on the line between two numbers. This bet will pay out if either of those numbers comes up and pays at 17 to 1. On the other hand, a line bet is a bet placed on a single horizontal line of three numbers. This bet pays out at rate of 11 to 1. A corner or square bet is a bet on four numbers and is placed on the meeting corner of the four numbers you wish to bet. This pays at 8 to 1. A six-line bet is like the horizontal line bet, referred to about as a line bet, but instead of betting on one horizontal line you are betting on two streets. Finally, a basket bet involves placing your bet on the line between the 0 or 00 spots, which is shared with the 1, 2, or 3 spaces. Unlike inside bets, outside bets are made by placing your chips on the outside section of the board. These bets usually pay out at lower rates, but your odds of winning are significantly higher! The1-18 bet is self-explanatory; if the ball lands on a number between 1 through 18 you win. Similarly, the 19-36 bet will also pay you out at even money if the ball lands on any number between 19 and 36. You can also bet on the color of the number, red or black, and depending on whether your choice wins or not you will be paid out evenly. Like the red or black bet, you can also bet on the number being odd or even. This bet also pays out evenly. As you may have noticed the odds and payouts for all the aforementioned bets are identical. This is because you are betting on different halves of the total of numbers on the wheel. Dozens bets, on the other hand, are made on one of three separate groups of numbers. You can either bet on the 1-12 dozen, the 13-24 dozen, or the 25-36 dozen. These bets pay out at 2 to 1 and the odds are somewhat lower. Column bets are similar to dozens bets as they are also bets placed on groups of 12 numbers. Instead of being divided by their order, these groups are divided into the three columns of the roulette boar. This bet also pays out 2 to 1. 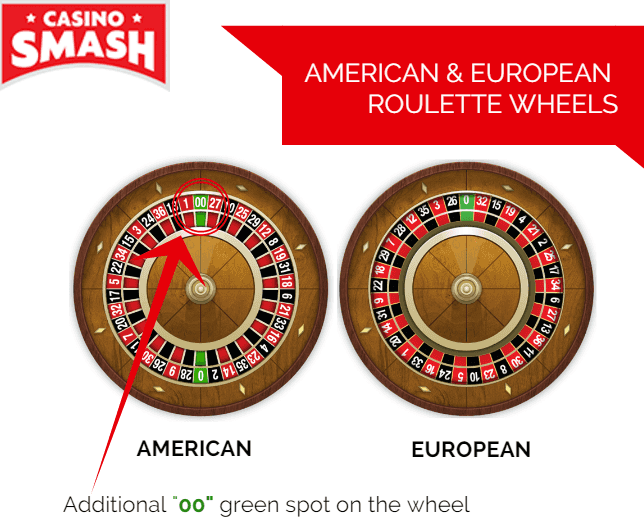 When playing roulette, there are three main types: American, European and French Roulette. In European roulette, there are 36 numbered slots on the roulette wheel and, therefore, 36 straight betting possibilities. In addition to the 36 red and black numbers, there is also a green slot, which is also known as the zero slot which is the main source of the house’s advantage. It is not possible to bet on this green slot and if the ball lands there then the house wins. American roulette is the same as European Roulette in terms of the board and payouts but has one major difference. Instead of there being only one zero slot, there is an additional double zero slot. This doubles the advantage the house has when compared to the European version. French roulette is the same as European roulette and only has a single zero slot, but there is a very special feature that makes this the best version of roulette when it comes to your odds as a player. Thanks to La Portage, every time you make an outside bet in French roulette that pays 1 to 1 and the ball ends up in the green slot, you will only lose half your bet. Therefore, when it comes to choosing the version with the best odds, French roulette is the way to go! Roulette Strategies: How to Win! Now that you know the basics of the game, you are more than capable of moving onto more complex subjects. First and foremost, we recommend that you have a look at our roulette checklist before hitting any virtual or physical roulette table. Once you have ticked all the main points, we advise that you study our roulette odds strategy, including the Martingale System for roulette. Check out an extensive list of the best roulette tricks to maximize your bankroll when hitting this classic casino game!